Episode three starts with a lovely flashback of the head scientist, D'Branin, trying to put his mission together. He gives a presentation to the great and the good, and is met with zero support. It turns out that it is only then, when all seems lost, that Captain Eris contacts him and allows him the chance to put his plans into action. I had assumed the Nightflyer was just a taxi service, and Eris little more than an Uber driver, but it seems the captain has a much bigger interest in the mission than initially hinted at. 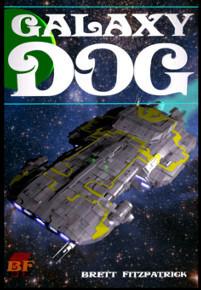 In the original story, the captain and his ship had no interest in the science mission, and the haunted house plot simply derailed the whole discovery angle of the story. Here, hopefully, it seems like something more complex is going on. It is much more satisfying that both Eris and D’Branin have an interest in the passing aliens. It is these kinds of subtle improvements to the original novella that give me high hopes for this series. After just three episodes, I’m enjoying the hell out of it right now, and I’m hopeful it isn’t going to let me down. The flashback ends and we are on the Nightflyer, where a funeral for two of the crew is in full swing. 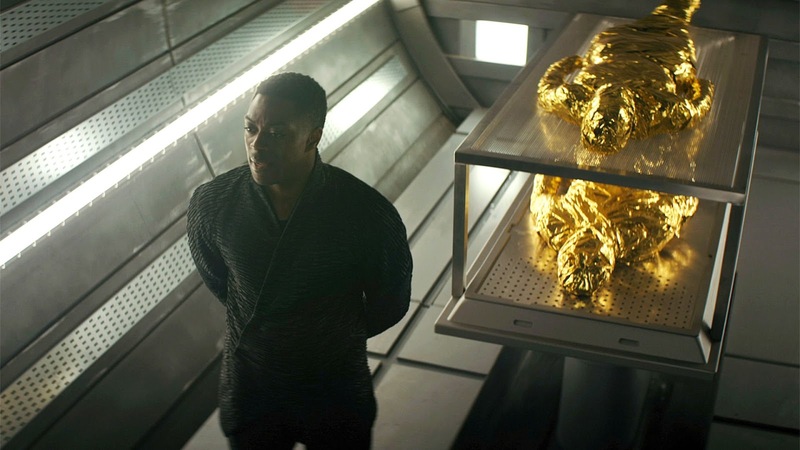 They are ejected from an airlock, wrapped in gold foil, to make for a couple of very attractive space mumies. Then we get to see how Lommie and Jhirl’s relationship is developing. These two are very different people, which is nicely underlined by the way they talk about emotions. Jhirl makes it cleat that she sees emotions as something to be avoided, while the look on Loomie’s face makes it obvious that she has exactly the opposite opinion. There is also a stark contrast in the way the two women inhabit their bodies. D'Branin invades their intimate moment, and Jhirl is almost confrontational in her refusal to hide her nakedness, while Lommie won't come out from under the covers. These two characters are fascinating, and I like the way Eris is attracting Jhirl’s attention, undoubtedly to the chagrin of Loomie. There is a lot of good stuff here, and I have no idea how it’s going to play out. When D'Branin isn’t invading his team’s privacy, he again takes time to call his wife and talk about memories, and the implied threat in her words becomes ever more explicit. In order to forget their child, she might even be forced to forget him. The story is constantly playing with memory and experience, and this scene nicely emphasizes just how editable and unreliable human memory is in this universe. After talking to the bee lady, Rowan suddenly wants to do some experiments. He brings Thale a white rabbit to attempt communication with. The telepath sees no “rabbity thoughts,” only demonic imagery. Strangely, the white rabbit dies but the telepath can still hear its voice. It turns out he wasn't hearing its voice, he was hearing a tape worm. Dr. Agatha Matheson (Gretchen Mol) is in the background of these scenes, but otherwise pretty much uninvolved in the action of this episode. I had assumed that she was the star of the show, a kind of Ripley character, but the writers are not afraid to let her completely fade into the background. 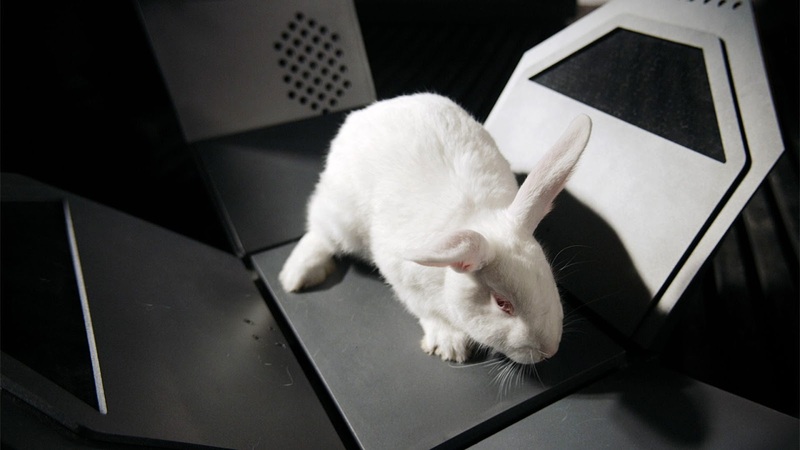 Thale’s complete failure to understand the parasite within the rabbit doesn’t bode well for his chances of being able to understand alien minds when he is exposed to them. I would like to see him given the chance though, just to see how spectacularly he messes up. Amusingly, Lommie discovers a problem with the drives that can only be fixed by switching them off and on again. Jhirl gets a bit cooked by radiation while doing this reset, and takes a healing bath in milky stuff. These scenes are absolutely amazing. The visual imagery of the white milk, completely covering Jhirl’s body, is mesmerizing. You can’t help but see how poor Loomie would become obsessed with the regal, milk-bathing, Jhirl. Rowan, after handing over the rabbit, is grabbed by D’Branin, who wants his help in gaining access to the captain's quarters, where he hopes to meet the real captain, not the digital projection. The architecture of this section of the Nightflyer is very Gothic, for a spaceship, but still believable. 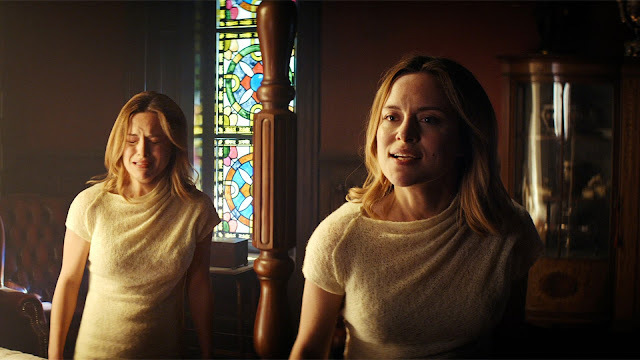 Upon breaking into Eris's quarters, D’Branin and Rowan find a reconstruction of the inside of a mansion, in an American Gothic style. Here the styalised surroundings are hard to imagine as being part of a starship. They are very definitely, just from looking at them, a reconstruction of a structure from Earth. Very soon D'Branin is confronted by a hologram of his wife. She is obviously a hologram, and is pulling out pieces of her brain. Eris turns up, and D'Branin asks what the hell is going on. The Captain tells him that all the weird stuff is being done by his mother. Her consciousness was uploaded to the Nightflyer after her death, and it is her who has been trying to kill the scientists, and their security people. 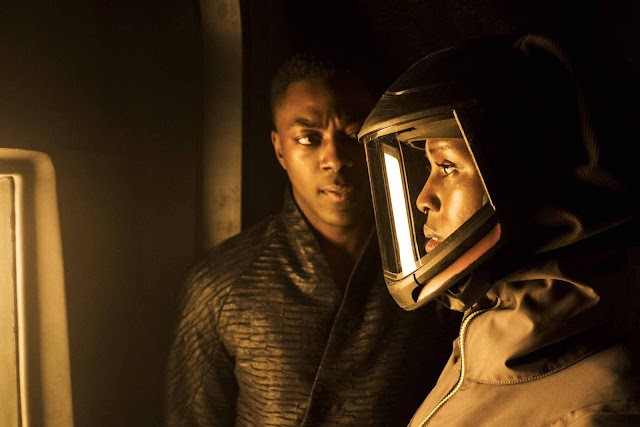 This was another very powerful episode, that built on themes that have already been introduced, added depth to characters, and introduced the character of the captain’s deceased mother. In the original novella, the mother wasn’t introduced until almost the end. She was revealed almost as if she was intended to be a plot twist. It is very encouraging that the TV show is going in another direction. I like that the mother is revealed earlier, and I hope she is going to be developed into a much more interesting antagonist.